My own pattern The Leftover Crochet Sock is now available for purchase. Please note that if you're searching for it on Ravelry it's called "The Leftover Sock" because the word "crochet" is a keyword. This is what I found out when I submitted my pattern name last week. I'm such a newbie! But I'm still calling it the Leftover Crochet Sock anyway. I launched the pattern this weekend at the Houston Fiber Fest from the Inner Loop Dyeworks booth (lovely Beth at Inner Loop Dyeworks gave me yarn support - beautiful Valentine and Electric Blue sock yarn). I designed the sock for the class that I taught at the Fiber Fest on Crochet Sock Techniques so that it wasn't just me talking for two hours straight. Although I am sure I could probably ramble on about the back story of my crochet sock addiction for two hours and show them my sock samples and tell them all about the best designers etc......I used some very simple sock techniques in my pattern - short row heels and extended single crochet stitch. It's small and very quick to make. It comes in three sizes: 6-12 months, 1-3 years and 3-5 years. And I've called it the Leftover Crochet Sock because you can use up your leftover sock yarn - if you're anything like me you have leftover yarn and it's a problem!! I need to say a big thank you to all the people who helped me get this pattern out. There are A LOT of people who go into producing a pattern. First Marie Segares for her Creative Yarn Entrepreneur podcast for telling me the proper way to do things in the Designing and Publishing Patterns mini series... And my super tech editor was Sam of A Simple Melody She was wonderful - and I really thought I'd picked up every little error and typo after reading it a approximately a million times but no - she pointed out a lot of mistakes and also made suggestions. She also checked it again after my test crocheters had tried it out Diane, Ilse and Cat. Diane went above and beyond taking step by step photos for me to give out to my students, without me even asking her to. 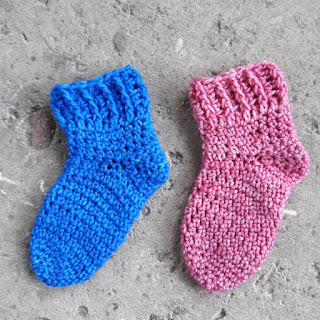 Diane did get me into all this sock business though - she was the one at my Nimblefingers workshop who said she wanted to learn crochet socks... And then I had to get it looking pretty so Leah made it into a very good looking pdf. Hope you have a wonderful week. I'm going to do a write up of the Houston Fiber Fest for next week's blog so be sure to come back then! Thank you Nicole! If you ever put your needles down and pick up a hook maybe you'll give them a go! Thank you Jodie!! It really was a team effort getting the pattern out there into the world! !